VANCOUVER - The number of humpback whales on the northern coast of British Columbia nearly doubled in eight years, but possible oil spills could seriously hamper recovery efforts involving the threatened mammals, a new study suggests. The acoustic animals known for their songs on breeding and feeding grounds were photographed and identified through unique markings on their massive flukes, or tails, around Gil Island, a summertime feeding destination for the migratory animals heading to Hawaii. Lead author and marine conservation biologist Erin Ashe of the B.C.-based group Oceans Initiative said the number of whales in the study area increased from 70 humpbacks in 2004 to 137 whales in 2011. The study, published in the online journal PLOS ONE on Wednesday, said the animals tend to be concentrated in the coastal fjord, where tanker traffic would increase if the federal government approves a proposed pipeline to ship large volumes of crude oil through the region to Kitimat, B.C. Ashe, who is also a PhD candidate at the University of St. Andrews in Fife, Scotland, said any oil spills could be catastrophic for humpback whales, which can be as long as long as a city bus and weigh up to 40 tonnes. Ashe, who analyzed the photos, said about 30,000 whales were hunted in the Pacific region covering B.C., Washington, Oregon, California and Alaska and that about 1,200 whales were left before they were listed as threatened in Canada and endangered in the United States. Humpbacks were legally hunted in Canada's Pacific region until 1966, a year after whalers killed the last humpback in B.C. waters. Ashe said that while recovery efforts are encouraging, any more threats to humpbacks must be managed to ensure their long-term survival. "It's encouraging that the numbers are increasing, and we see that throughout the north Pacific that humpback whales are recovering. But I think it's important not to get complacent because they are not fully recovered and also to view their recovery in the context of these new threats that could impact the population. "So while they're still at this important recovery stage it would be a shame to inundate them with this additional threat," said Ashe, adding the humpbacks are sometimes seen with wounds from propellers and fishing gear. The panel weighing the proposed Northern Gateway oil pipeline heard that about 220 tankers carrying crude a year would use the waterways of the north coast if the pipeline is approved. The B.C. government's plans to put liquefied natural gas into ships bound for Asia would also increase the number of tankers leaving the northern coast. In June 2012, a humpback that beached itself off a White Rock, B.C., beach had become trapped in fishing gear through its mouth. In May, a Campbell River man whose boat collided with a humpback whale needed facial surgery, prompting marine life researchers to warn boaters to be careful because of an increasing number of humpback whales around Vancouver Island. Ashe said the man went through the windshield and it's likely that the whale was also injured. Industrial developments are dramatically changing shipping patterns in the Gil Island area, considered critical habitat for the whales, which are vulnerable to being struck by the vessels, she said. 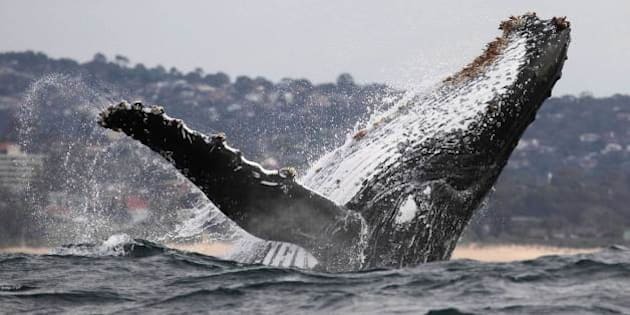 The so-called acrobats of the ocean, with dive sequences where the whales slam their flukes into the water, have also led to a growing whale-watching business. That has increased noise levels for the humpbacks, which rely on sound to communicate with each other. "Repeated disturbance can affect behaviour and activities of humpback whales," said the study, which also included surveys done by the Gitga'at First Nation. "An increase in the cumulative impact of stressors that humpback whales experience on feeding grounds could carry costs to substantial fractions of the population," the study said, adding habitat loss in B.C. would affect the animals at a particularly vulnerable time in their life. "Humpback whales undergo one of the longest migrations of any mammal. Therefore anthropogenic activities affecting humpback whales on B.C. 's feeding grounds would impact individuals at a point when they have gone several months without feeding, and may lack resilience to cope with additional human-caused stressors."